I decided to write this article in English so that this tip is more accessible to the Android users community. Install the application OI FileManager on Android (it enables browsing your file system and could be useful besides !). 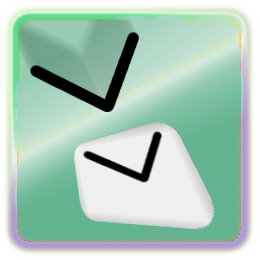 Copy your SMS dump file on a determined location of your phone (most probably on your sdcard). Add your own patterns if you need to. The parser will recognize each $(var) string, replacing it by the matching value. It will also parse a date by identifying it in the var name. For example, $(dateMM/dd/yyyy) will recognize “03/10/2010”. It will also replace “[\t]” strings by tabs and “[\n]” strings by line feeds. Select your file and choose your conversion set. Start conversion and wait for a while. If it says “Successful”, that means your SMS messages were imported ! When I try to import sms as an .csv-file from my Nokia N8 I get the the message “Failed java.lang.Exception: No SMS imported.” Please help me soon. Hi there mate, and thanks for developing this handy tool! I’m experiencing a problem I get a Java exception error. I have used Excel import to validate the syntax and it seems ok.
Is there any debugging option in your tool? Maybe you could point out what line number issues the error to help user to set properly the CSV. – Could it be possible to edit patterns on the pc and store them in the program folder on the phone? Where do you store regular experssions? – Does the latest tool version stores succesfully also sent messages in such a way they will appear correctly in conversations? When I try to import sms as an .csv-file from my HTC diamond I get the the message « Failed java.lang.Exception: No SMS imported. » Please help me soon. I successfuly transfered my sms messages from Nokia 5800 to HTC Desire. 1. Check generated CSV file – no strange symbols or anything like that. 2. File encoding must be UTF-8. If not – open in Notepad, “save as”, and choose encoding. 3. No newlines in messages! I have some, fixed by hand. In Athg2Sms can’t handle such lines and you got that java Exception. LiBe, can you add “multiline message” support? It would be helpful. thanks, it work perfectly; i have a nokia 5800 and i needed export sms from nokia 5800 to LG optimus Black with android 2.2. Only one thing, with “Nokia PC suite” (old version of nokia suite) you don’t need to do changes in csv export file. 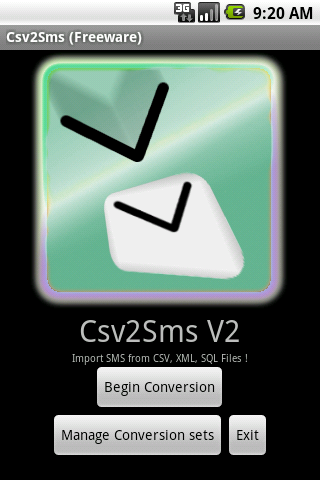 I’m trying to convert my CSV file from a Blackberry to my phone. The format of the CSV file is “phone number”, “Date (MM/dd/yyy hh:mm)”, “Folder (shows either inbox or outbox), and “Message”. How should I write my pattern? has anyone tried to use this with archived SMS of Siemens mobile phones? (file extension is *.smi or *.smo). Unfortunately these are not plain text like CSV.. I installed the application on Samsung Galaxy Xcover GT-S5690, with Android 2.3.6 Kernel version 2.6.35.7 with OI File Manager installed. Hi can u help me to convert this into LG “conversion set”? hope u can help me, thank you in advance..
, exceto isto webpage fornece recurso baseado escrevendo.